As I recounted last month, at the start of 2011 I made a list of 10 classic films I've not yet seen, with the goal of finally catching up with them in 2011. 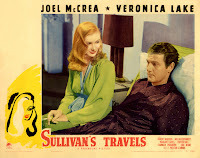 So far I've crossed SHANE (1953) and DOUBLE INDEMNITY (1944) off my list, and what better day than Joel McCrea's birthday -- and the grand opening of his ranch to the public -- to finally see SULLIVAN'S TRAVELS? I've seen numerous films written and/or directed by Preston Sturges over the years, including his other collaborations with Joel McCrea: THE PALM BEACH STORY (1942), which never fails to make me laugh despite countless viewings, and the rather odd THE GREAT MOMENT (1944), the story of a dentist inventing anesthesia, which as a teenager I saw in 35 millimeter at the Vagabond Theater in Los Angeles. 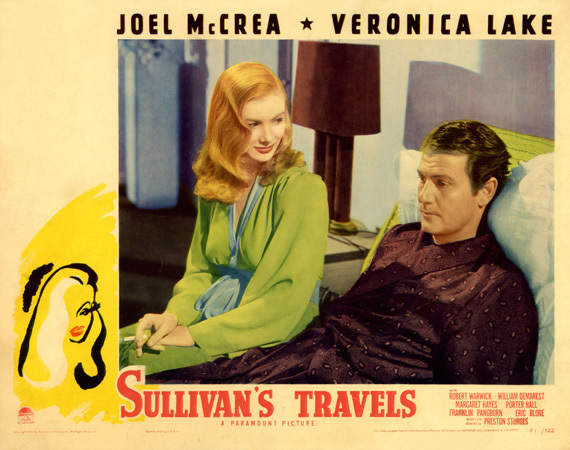 SULLIVAN'S TRAVELS is the story of John Sullivan (McCrea), a director of money-making silliness such as ANTS IN YOUR PANTS. He longs to make a serious picture about suffering humanity, O BROTHER, WHERE ART THOU? -- a title later borrowed for a 2000 Coen Bros. film starring George Clooney -- but decides that first he must learn what it's really like to be poor. And so he becomes a hobo and begins his "travels," along with way pairing up with a girl (Veronica Lake) who buys him breakfast. Much of this film really tickled my funnybone. 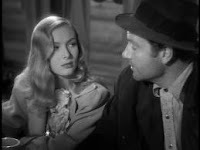 I loved the fast-paced dialogue in the early going, McCrea's deadpan delivery (he may be underappreciated as a comedian), and I thought Veronica Lake was brilliant in an original performance. There were some great set pieces, and some lines that have to be seen in context to be appreciated, such as Sullivan sighing over his seeming inability to get very far away from Hollywood. And although I tend to prefer verbal to physical humor, there was also a very funny slapstick sequence involving a bus which reminded me a bit of the train sequence in the following year's THE PALM BEACH STORY. However, the film stopped working for me in its last third. I know I'm in the minority, given the reviews I've read over the years, but the film came to a screeching halt for me at that point, when the comedy stops and one tragedy follows another, becoming downright unpleasant. It's kind of ironic that while these scenes are used to make the film's ultimate point about the importance of laughter, they are the very kind of dreary O BROTHER, WHERE ARE THOU? scenes that Sullivan decides against making. Many critics have found the film's mixture of comedy and drama brilliant, but on this first viewing, my honest reaction is that the combination was unexpected and awkward. Some films can straddle a variety of genres and work regardless -- HISTORY IS MADE AT NIGHT (1937) is one of the most notable examples -- but the contrast between scenes such as the really marvelous sequence which finds McCrea, Lake, Eric Blore, and Robert Grieg all in a swimming pool, with the later scene of the chain ganged McCrea nearly dying in a "sweatbox," was too jarring for my taste. I started out watching one type of film and ended up watching something completely different. Nonetheless, this is a unique film, with a terrific first hour and a lot of humor and substance, which will be worth revisiting in future years. Perhaps it will strike me differently on a later viewing, as sometimes happens. And although I generally disliked the film's last half hour, as a Disney fan I did enjoy the use of a Disney cartoon to make the point that the world needs more laughter. The large cast includes many Sturges "regulars," including William Demarest, Franklin Pangborn, Robert Warwick, Porter Hall, Roscoe Ates, and Chester Conklin. It runs 90 minutes. This Paramount film has been released as part of the Criterion Collection. It comes with a wealth of extras, including a commentary track and the documentary PRESTON STURGES: THE RISE AND FALL OF AN AMERICAN DREAMER. This DVD can be seen via Netflix. It's also on DVD as part of the Preston Sturges Filmmaker Collection. SULLIVAN'S TRAVELS has also had a release on VHS. 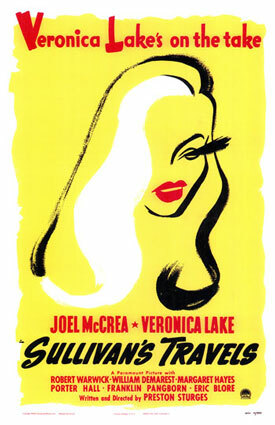 SULLIVAN'S TRAVELS will next air on Turner Classic Movies on November 22, 2011. The trailer can be seen on the TCM website. One of my very favorites. And a great film to learn more about the era just before the war. I think of it as the last Depression movie. 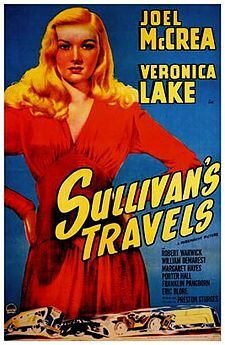 It's been a long while since I've seen Sullivan's Travels, but it's right up there with The Lady Eve among my favorite Sturges films. I always thought it got darker and depressing toward the end precisely to underscore that Sullivan shouldn't make that type of film. In other words, it's not ironic that the film becomes O Brother Where Art Thou - it's the whole point.